Our gift to you…. December’s Issue of SGNScoops Magazine! Our Christmas edition is stuffed with Christmas goodies, so join Scott and his friends as they open their gifts and celebrate the holidays! 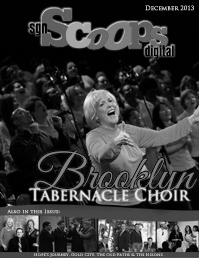 Enjoy the cover story on the Brooklyn Tabernacle Choir and also enjoy reading about the ministries of the Old Paths Quartet, Hope’s Journey and Gold City Quartet. Christmas is about giving, so don’t miss special guest writer, Kelly Nelon’s story about the Nelons latest mission trip. Also don’t miss the story about Steve Ladd’s sharing! This issue includes Christmas Music Reviews as well as Christmas Inspirational articles on Unopened Gifts and Christmas Traditions. Check out concert stories in the Isaacs and the Lesters and don’t miss Ben Wolfe’s younger perspective on things. Get caught up with Christian Country News, enjoy Life, Love and Legends with Lou Hildreth and read about plans for 2014 Creekside Gospel Music Convention and Diamond Awards. To make this Christmas Season special for our readers, we have surveyed many of your Southern Gospel Favorites and collected their favorite lines of Christmas carols and songs. December’s issue is most definitely a joyful one! Please read and share with your friends, families and fans and also let our staff know how much they are appreciated! Merry Christmas from the SGNScoops Family!